Wherever water is at work, Kinetico can help you make it work even harder—and better—for you. Kinetico delivers the highest water quality reliably, continuously and to the most exacting standards, which is why so many companies of all sizes and scopes, all over the world, entrust their business and public works projects to us. Just as water sustains life, water powers your business—from large municipal and industrial applications to small businesses and everything in between. Kinetico water systems ensure that your customers get nothing but the best. From furthering best practices to developing bold, new ways of thinking, Kinetico engineers have historically developed water systems that outperform existing technologies and set new standards for the industry. In 1970, Kinetico patented the only water system powered not by electricity but by the kinetic force of moving water; today, we boast a complete portfolio of products that meet every need of the commercial, industrial and municipal markets. Whatever your application and whatever your industry, Kinetico water systems exist to keep you ahead of the curve. By partnering with you to develop a solution tailored to your exact specifications, Kinetico water systems help you meet environmental regulations, exceed performance expectations and satisfy demand. Investing in a Kinetico water system for your business or community provides you with not only the best technology and products available but extraordinary service as well. Whether upgrading an old system or expanding an existing one, Kinetico commercial professionals bring a wealth of knowledge that can help streamline the process and ensure all your water needs are squarely met. Since day one, Kinetico has built savings and sustainability into each and every one of its water systems. Kinetico systems cost less to operate and are more reliable—and they clean themselves with treated water, which prolongs filter life, saves on salt and produces significantly less wastewater. Factor in the savings that businesses realize by protecting equipment and reducing costly inputs with quality water, and it’s clear why partnering with Kinetico is the best investment you can make. Why put up with the expense and fuss of delivered bottled water? Our Office Water Coolers are the perfect solution! No more bottles! Just hook up a water line for fresh, pure hot or cold water! Hot water, cold water, room temperature: the selection is yours. 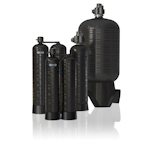 Multi-Stage Water Treatment is included with all CS Series units. Treatment is available in three configurations- Ultrafiltration, Reverse Osmosis and Reverse Osmosis with booster pump. All configurations include a carbon/sediment pre-filter and carbon block post-filter. Recessed Faucet Tap. Prevents accidental touching to reduce contamination of the dispensing port. Built-in Microprocessor Control. Monitors all functions of the system including reservoir level, water treatment operation, heating and cooling function and temperature set-points. Front Drain. Allows for convenient draining of the internal water reservoir. Hot Water Faucet with Safety. Prevents burns from accidental dispensing. Faucet lever is pushed back while the safety is depressed to allow hot water to be dispensed. Cold Water/Ambient Water Faucet. Can be dispensed from the same tap. Dual function faucet rotates to dispense either water supply. Continuous Dispensing. Achieved by pulling faucet lever forward. Quickly and safely fill a pitcher or coffee pot. Automatic Water Temperature Control. Provides four incremental adjustments for cold and hot water. Dispense water from 40 to 200º F.
Efficient Heating/Cooling System. Accomplished by a unique thermal management system. Both hot and cold water is produced by the same heat exchanger, thus maximizing the energy efficiency of the system. Electric Water Level Control. Provides a digital, visual display of the remaining volume of hot and chilled water. Air Tight Reservoir. Prevents airborne particles and other secondary contaminants from entering the processed water reservoir. Double Shut-Off Protection. Prevents water overflow from the processed water reservoir. To learn more about Kinetico bottle-less water coolers contact us.